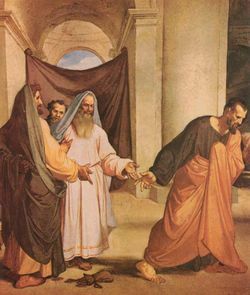 Not too long ago I did a post on the publication of The Gospel of Judas. Well, it's finally out. This weekend you'll be seeing quite a bit about it in the news and on television. 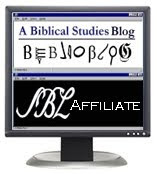 In order to make that post more accessible I've added it to the sidebar section "Online Articles on Biblical and Theological issues". I hope you have a longer show at some point in the future. Is there any chance of doing a podcast once or twice a week? So many great posts I would love to hear more about in a podcast setting. I am really swamped as it is. Perhaps in the future I'll be able to do something like that. generosity with which NG have placed the text and translation online, may I suggest that we repay them by buying their book? and I have also placed it here in HTML form, for those who (like myself)hate PDF's. * Codex Tchacos is named after Dimaratos Tchacos, father of Zürich-based antiquities dealer Frieda Nussberger-Tchacos, who bought the document in September 2000. The codex contains not only the Gospel of Judas, but also a text titled James(otherwise known as the First Apocalypse of James), the Letter of Peter to Philip, and a fragment of a text that scholars are provisionally calling Book of Allogenes. * The codex, containing the Gospel of Judas, was discovered in the 1970s near El Minya, Egypt, and moved from Egypt to Europe to the United States. Once in the United States, it was kept n a safe-deposit box for 16 years on Long Island, New York, until antiquities dealer Frieda Nussberger-Tchacos bought it in April 2000. After two unsuccessful resale attempts, Nussberger-Tchacos-alarmed by the codex's rapidly deteriorating state-transferred it to the Maecenas Foundation for Ancient Art in Basel, Switzerland, in February 2001, for restoration and translation. The manuscript will be delivered to Egypt and housed in Cairo's Coptic Museum. * Several pages of the Gospel of Judas as well as pages from the other three texts in the codex will be on exhibit at National Geographic Society headquarters in Washington, D.C., beginning Friday, April 7, 2006, for a limited engagement. After Kasser and his team complete conserving and translating the manuscript, the codex will be given to Egypt, where it will be housed in Cairo's Coptic Museum. * The National Geographic Society submitted five tiny samples of the Gospel of Judas for AMS testing at the University of Arizona's radiocarbon dating lab in Tucson-the same lab that dated the Dead Sea Scrolls. The Judas fragments included four minute pieces of papyrus and a small bit of the book's leather binding with a piece of attached papyrus page. No part of the ancient script was altered or damaged during this process. The results allowed lab experts to confidently date the papyruses to between A.D. 220 and 340. "The calibrated ages of the papyrus and leather samples are tightly clustered and place the age of the Codices within the third or fourth centuries A.D.," reported Tim Jull, director of Arizona's AMS facility, and research scientist Greg Hodgins. * Stephen Emmel, professor of Coptic studies at Germany's University of Munster, analyzed the Gospel of Judas ... "The kind of writing reminds me very much of the Nag 'Hammadi codices," he wrote, referring to a famed collection of ancient manuscripts. "It's not identical script with any of them. But it's a similar type of script, and since we date the Nag 'Hammadi codices to roughly the second half of the fourth century or the first part of the fifth century, my immediate inclination would be to say that the Gospel of Judas was written by a scribe in that same period, let's say around the year 400." * McCrone Associates, a firm specializing in forensic ink analysis, conducted a transmission electron microscopy (TEM) test on samples of the document's ink. The procedure uncovered the components used to create the ancient ink and found that they are consistent with ingredients in known inks from the third and fourth centuries A.D. The ink includes a carbon black constituent, in the form of soot, bound with a gum adhesive. An additional procedure, Raman spectroscopy analysis, established that the ink also included a metal-gallic component like those used in third-century iron-gall inks. McCrone Associates reports that the Gospel of Judas may have been penned with an early form of iron-gall ink that included a small amount of carbon black (soot). If so, it could be a previously unknown "missing link" between the ancient world's carbon-based inks and the iron-gall alternatives that became popular in medieval times. It's funny that this work has attracted so much speculation now. I was somewhere the other day where a morning show was on the TV, and the newsperson was interviewing a couple scripture experts. She asked if it was possible that Judas was getting a bad rap, or something like that. Her whole tone was speculative, that the church might be discounting this work because it could upset our current view of things. So at best, we're looking at this work a good 1700-1800 years after it was written. When the early church put together the books of the Bible, I'm sure they knew about this work too. It got left out, along with other works. Isn't it reasonable to assume that the early church, which was in much closer proximity to these original writings, was in a better position to discern God's will for the canonical scriptures? It just makes som much sense as to be obviously true; but that doesn't make a good news story.